St. Louis was a tricky track, similar to what we saw last week at Indianapolis. The softer dirt leads to ruts, an ever changing surface and increased level of difficulty. Let’s take a look at how the riders coped. This is a sequence of pictures taken in the berm just before the mechanics area. 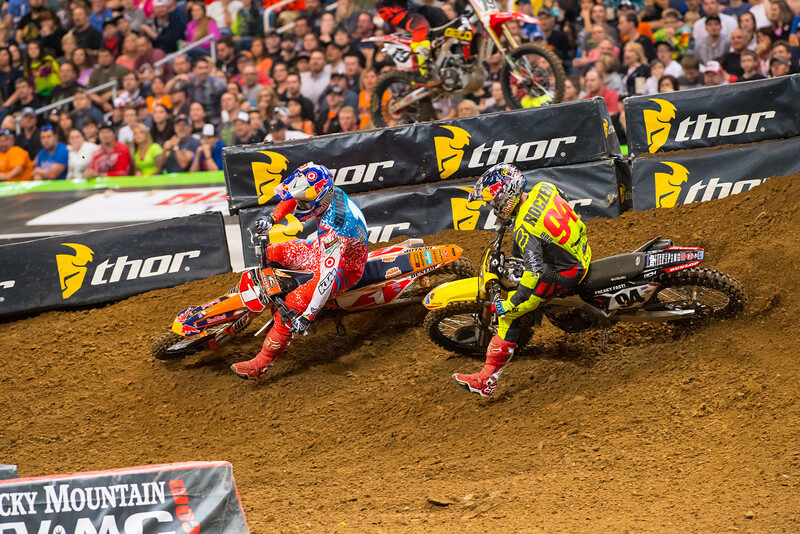 This was the height of the pressure that Ken Roczen had applied to Ryan Dungey. 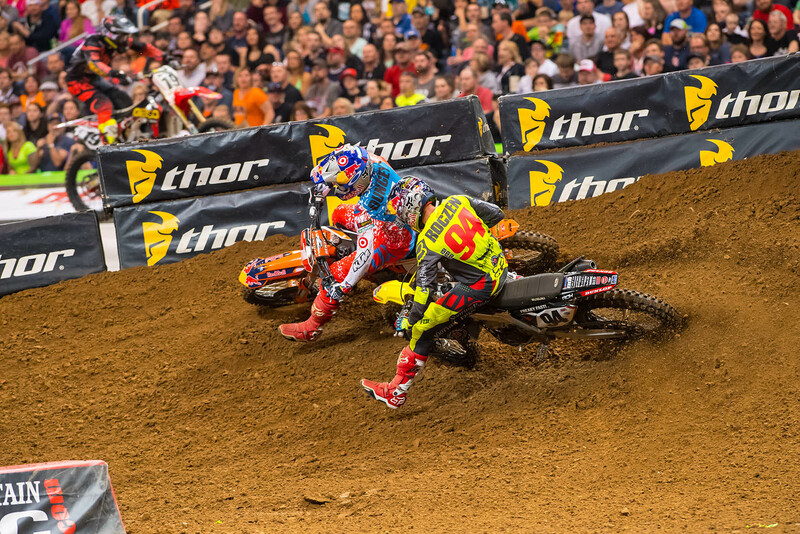 Roczen had railed the outside of the sand berm prior to this turn and gotten a good run on Dungey as they entered the big, open berm. 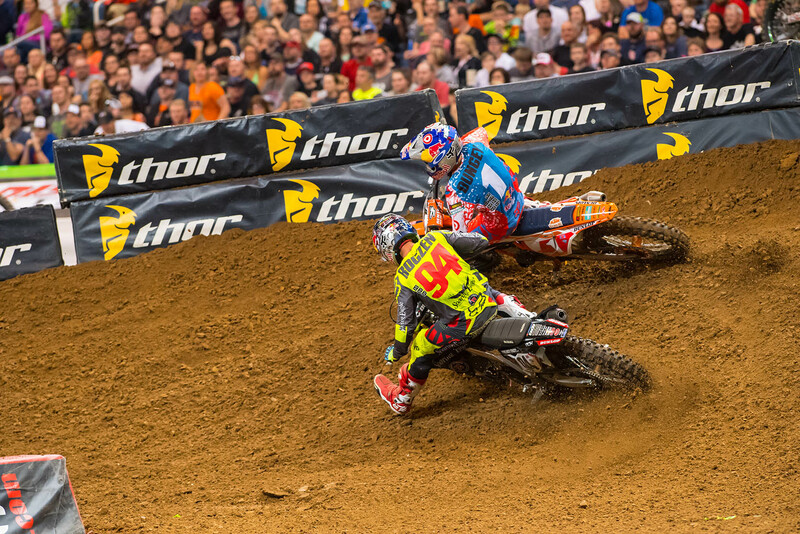 Dungey drew a pretty bold line here. 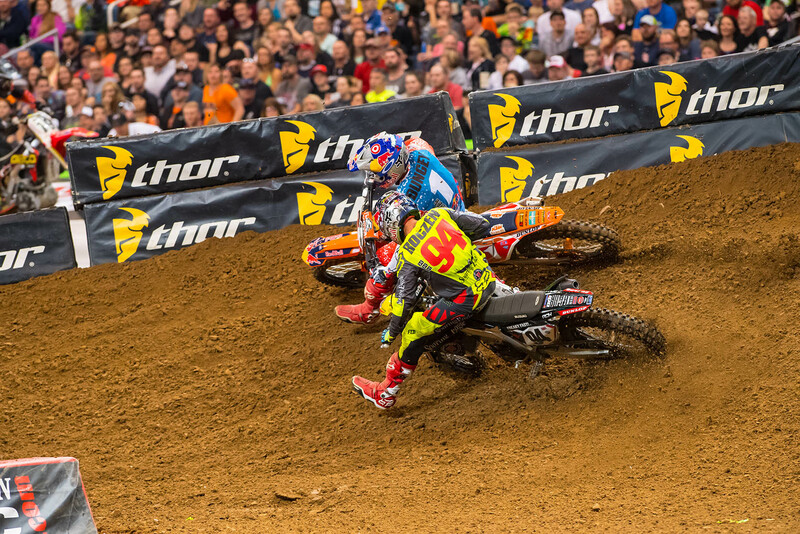 Watching his line choice, his trust in Ken Roczen is very evident. They have never resorted to downright dirty riding and Ryan is assuming that will continue with his line here. He has left the door open a bit and while Kenny would have to make solid contact to make a pass, the opportunity is there. In fact, as you scroll through these pictures, you can see Kenny has the rear brake engaged and rear tire in a full slide in order to not make contact. 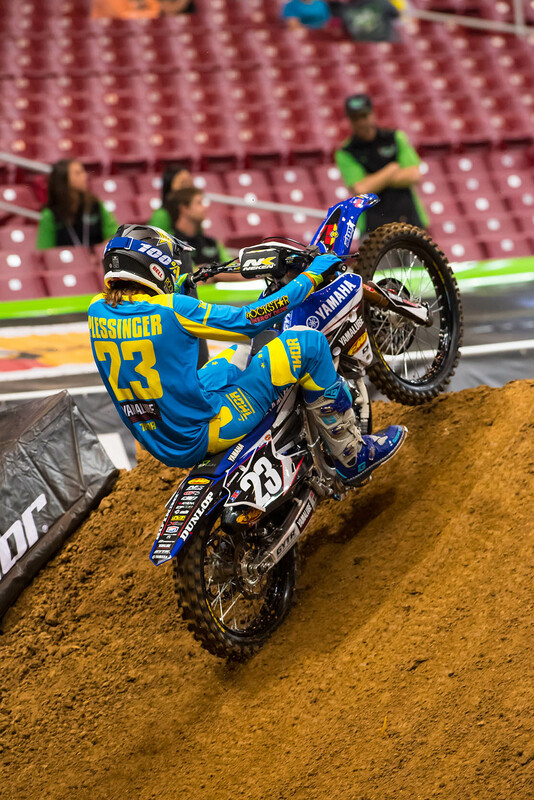 If he wanted to make contact, he could have eased off the rear brake and allowed his front end to continue climbing directly up the berm instead of making the sideways arc he’s starting here. He makes every effort to pull up and avoid contact. His goal was to be aggressive, hopefully force Ryan to check up in fear of impending contact, and then cut under and ahead of him. 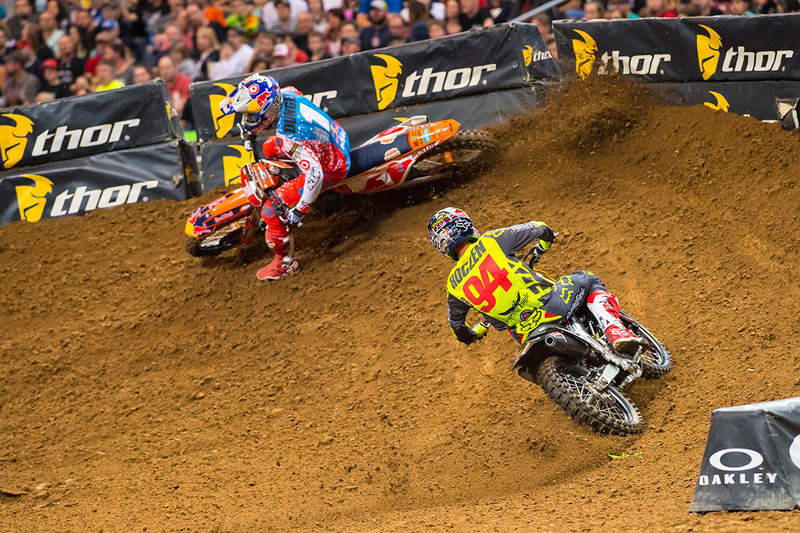 Instead, Dungey never hesitated. 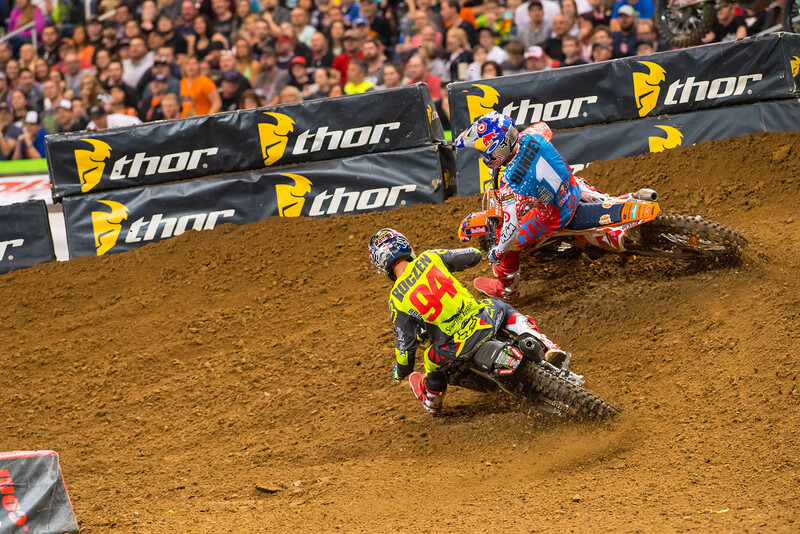 As Kenny slid his rear tire, he lost the ability to steer his front tire and had to submit to tucking in behind Dungey on the exit. It’s a bit of a stand-off in a situation like this. Knowing who you are racing against can be as important as anything else. In this particular case, Ryan knew that Kenny would not cross the line and therefore he carried his normal line. This scenario plays out very differently if A) the leading rider assumes he is about to get slammed or B) the rider in the back lets his front tire continue up the berm until contact is made. These two obviously respect each other’s ability above all else and haven’t resorted to cheap shots. That respect was displayed by each rider in this case. Dungey respected Kenny’s level of discipline and Kenny respected Ryan enough to avoid putting a front tire into his engine cases. If this picture could talk, it would say “I am too big for a 250 but I am going to send it anyway.” Aaron Plessinger is sitting into this triple face with every ounce of body weight he has. He will use that shock recoil to propel him higher and farther in hopes of down siding the triple. He is leaning back in order to pull the front end higher, giving him even more height and increasing his trajectory. This move is the polar opposite of scrubbing. It’s a desperate attempt to clear a tough obstacle right out of the 90 degree turn. Kenny was using the outside in the sand almost every lap. Both Jason Anderson and Ryan Dungey were going to the inside and there didn’t seem to be much of a difference on the stopwatch. Kenny’s technique was very good which allowed him to go a much further distance but still be just as fast. The important aspect of his style that gets overlooked is that he doesn’t rush a turn like this. He comes in and lets the natural momentum of the motorcycle take over. He applies gentle throttle through the turn and keeps his body in position to hit the line he aims for. As he begins to exit the turn, he opens up the throttle but doesn’t ever explode the turn or create wheelspin in the sand. Notice how far forward his leg and head are, and where he is positioned on the seat. All of his weight is on the front so he can pinpoint the front tire’s direction in the loose sand. His rear tire is not creating a huge roost because he is at a low rpm and not generating any unpredictability due to the tire breaking out of the line. It may look and sound slow but this is how it’s done. This is the same turn as in the sequence above. The main difference is in how Kenny’s approach varies so much based on his intentions. In the first sequence, he is trying to put pressure on Ryan and force a bobble, or at the least, create a window to sneak past. It is by no means the ideal entry angle for turning and in the last of those photos, you can see he is going to lose time on the exit. In these two photos, though, you can see Kenny turning at full speed. He is trailing the rear brake into the turn in contrast to the full lock he had to utilize in the above sequence. 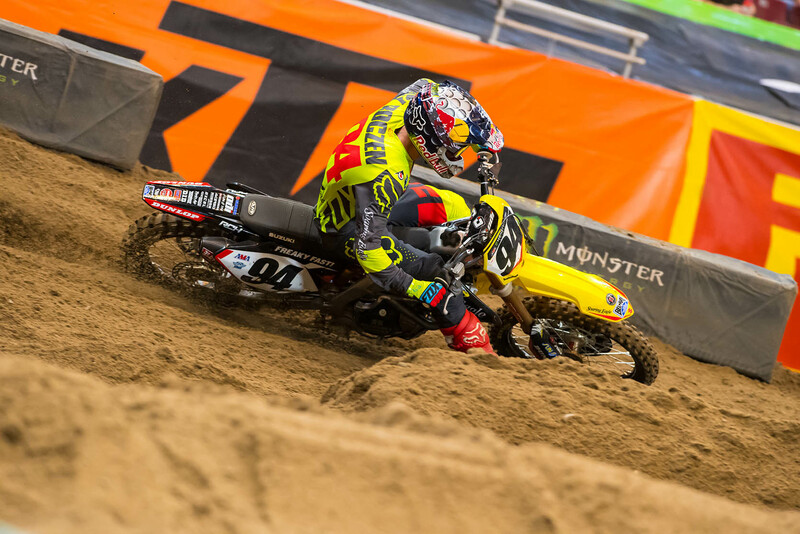 He will keep pressure on the front end in order to turn back down the berm, whereas in the first sequence, he lost pressure on the front end via the rear tire sliding. 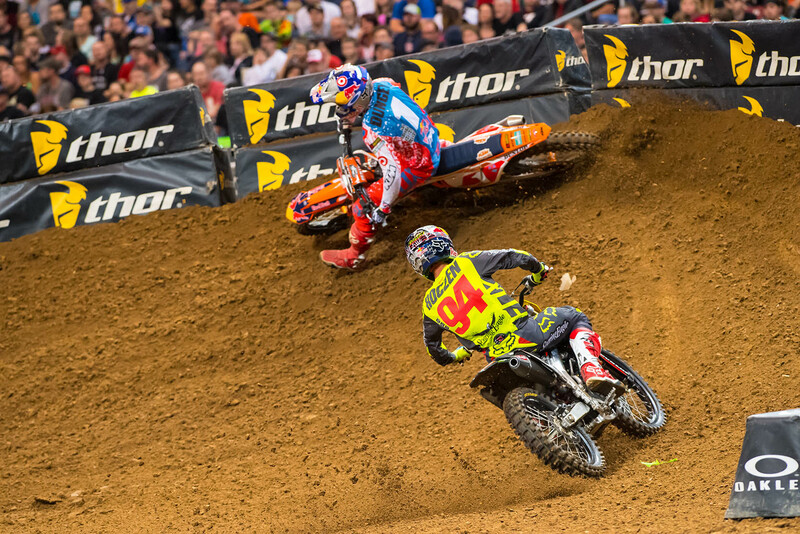 Here, he will be able to apply nearly full throttle at the apex and accelerate hard down the berm, much as we see Dungey already in the process of doing. He will lean hard to the inside with his head and body instead of the high-side look he had at the end of the first sequence. It’s a completely different intention and execution of the same turn.